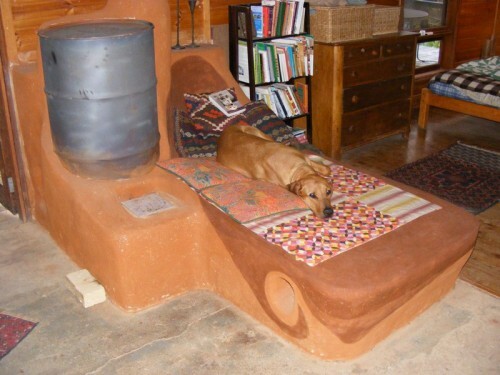 The Cob Mob, Karyn Stillwell Temple and Jason Temple, retrofitted their little cottage's sheet metal fireplace with a Rocket Stove thermal mass heater. The stove features a heated day bed/sitting platform and utilizes the existing chimney flue. "The heated day bed/seat coming out into the room works well for this space; it gently partitions the room into two spaces. At the end of a hard day's work the day bed is THE place to find me sprawled out on my back, healing my sore muscles.